C.C., the giant Pacific octopus who lives at the Vancouver Aquarium, mated and laid eggs nearly eight months ago. During the last week of August 2011, about 300 eggs (sampled periodically since May) hatched. According to Dr. Dennis Thoney, Director of Animal Operations at the Vancouver Aquarium, it's not unusual for octopus eggs to hatch in aquariums -- but very few hatchlings have ever survived. "Chances of survival are very low because giant Pacific octopuses have a seven to ten month long pelagic larval stage," explained Thoney. 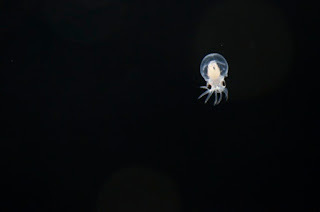 The aquarium will attempt to feed and maintain some of the larvae for as long as possible, in order to further their knowledge of octopus reproduction. C.C. was "introduced" to her male partner, Clove, in October 2010 in the Strait of Georgia display at the Vancouver Aquarium. Since mating marks the beginning of the end for octopuses, Clove died 67 days after mating. C.C. is expected to die naturally in the comng weeks with the egg incubation complete. Dr. Thoney said that opportunities to observe giant Pacific octopus mating are rare. "We've been extremely lucky to witness it several times here at the Vancouver Aquarium," he added. "We hope to learn more as we attempt to raise the newly hatched octopus larvae." The giant Pacific octopus typically lays around 70,000 eggs on average. Only a few are expected to survive to adulthood in their natural habitat.